We focus on supporting clients to choose the right technology, successfully implement and achieve their business transformation goals. Leverage our experience in vendor selection, business case development, project implementation and benefits realization to avoid the common pitfalls of technology projects. From start-ups to billion-dollar businesses, private sector to government services, Cascadia has managed the implementation of ERPs, Work Management Systems, HR Systems, Mobile applications, In-vehicle technology, and integrations across platforms. Cascadia allows you to focus on transforming your business and not have to worry about the tech. Implementing the right technology from the right vendor could make or break your organization. Cascadia has a broad range of tools to ensure the decision you make meets your short term needs and long-term goals. Starting with the software requirements and future state vision for your operations, we also ensure the software’s platform, development roadmap, security protocols and customer support will meet your needs, and not expose you to risk. A review of the vendor, its competitors and its market will provide insight into whether they will be around as long as you need them to be. Technology providers do a great job of highlighting the features and innovations of their solution, but recognizing the total costs of both implementing and operating new technology is easier said then done. Executives and project sponsors are being asked to provide the total cost needed to realize the benefits, not just estimating the bill for the technology vendor. 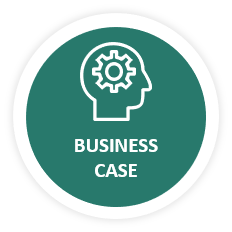 By implementing a range of custom systems, off-the-shelf software, mobile applications, field-ready hardware and customer facing portals, Cascadia has developed a business case methodology and templates which ensure you can identify all the benefits of your projects, and budget for the associated costs. A thorough business case will give all stakeholders the confidence to approve the project, and give the project delivery team the confidence that the project is setup for success. Choosing the right technology to meet your goals is the first step on the journey. Vendors are incentivized to meet the terms of their contract, while your operating staff is often consumed by their day-to-day responsibilities. Our business transformation teams work with your organization to minimize day-to-day disruptions and deliver projects that are not just on budget and on time, but also on target. Project management, vendor management, process design and change management; this is where Cascadia can ensure your project achieves its purpose. Don’t settle for what is easiest for the vendor, you might only get one chance to implement and roll-out successfully. Realizing the benefits of new technology is never a guarantee, not even when the project is flawlessly implemented. Benefits from projects are driven by the users, not by the technology, and often require communication, feedback and adjustments. Cascadia will work with your team to identify the measurable benefits of the project, develop Key Performance Indicators (KPIs), the communication plan, and the benefits realization strategy. KPIs can include cost benefits, time benefits, service level benefits, customer satisfaction, employee satisfaction, and others. Ensuring these benefits are measured and communicated to stakeholders is the first step, but creating actions from the KPIs is how benefits are realized. Cascadia works with staff to understand how their actions enable the benefits, and works with managers to understand KPI dashboards and identify improvement opportunities for their teams. Project benefits may be held back because business processes need adjustment, software doesn’t work as intended, staff need additional training, but too often teams just ‘learn to live with the new system’ and never address the benefits that weren’t realized. Whether you are making a plan before Go-Live or need to do a project checkpoint 6-months later, Cascadia helps to maximize project benefits. Context: A large BC municipality was facing a growing population, additional service requests and increasing complexity in their business, and wanted to leverage a new technology in their vehicles and in their back-office to improve operations and service levels. Approach: Cascadia worked with department managers, supervisors and vehicle operators to understand their day-to-day operations, and identify areas of improvement. Opportunities to reduce operating costs, reduce lost revenue, improve customer management and increase service level were identified and translated into functional requirements. Through a market scan and RFP process, Cascadia supported the City in evaluating various technology platforms and managed a proof of concept project with a leading vendor. The proof of concept, which included vehicle mounted GPS devices, RFID scanners and driver tablets, as well as back-office service management and dispatching, allowed the City to validate the technology, and identify customizations required for the City to fully adopt the system and achieve their target benefits. Results: The City was able to validate the technology and their business case prior to committing to a large technology contract, as well as negotiate a fixed fee implementation price. Project risk was significantly reduced by identifying existing and high probability issues with the technology, and mitigating the risk through contract terms. With the help of Cascadia, the City is currently rolling out the solution across their entire Waste Collection fleet.